The Enzo Complet Trundle Bed with a Meomory Foam Mattress. All you need in a bed. Comes with Two Mattress and Complete Trundle Housing. The top Mattress is removable and is Spring Coil and two layers of Meomory Foam inside. The bottom Mattress comes attaced to the movable trundle part. 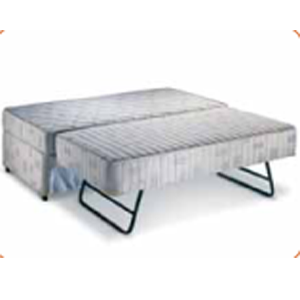 The movable trundle part lifts up to make the complete Bed a King Size. The Storage unit has a good quality Beige Jacard Fabric. The unit meets USA and California Laws for flame retardency. The Bottom Unit Is 39 In. x 72 In. Long and is adjustable Height.